Skill Cost: Four "other" skills, or as noted under O.C.C. Skills section. Special Attacks: Knife hand knock-out (Special! 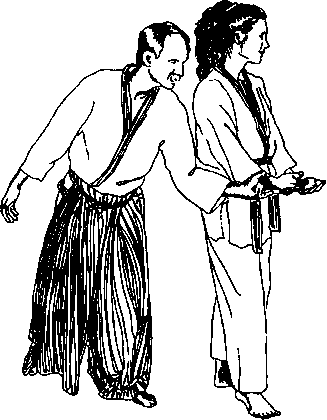 The opponent must first be in some sort of joint lock or bound. It does no damage but renders the victim unconscious for 2D4 melees. Requires a normal strike roll), combination automatic parry/strike, combination automatic parry/throw (automatic flip/throw). Modifiers to Attacks: Pull punch, knock-out/stun, automatic flip/throw, critical flip throw, critical strike. Additional Skills (Choose Two): W.P. Knife, W.P. Forked (Sai), W.P. Blunt (Tonfa), W.P. Paired Weapons. Also choose any two domestic or domestic:cultural skills, or Holistic Medicine (any) or Identify Plants & Friuts. Selected skills recieve a +15% skill bonus. Level 1: Add two additional attacks per melee, +2 to parry and dodge, +3 to breakfall, +2 to roll with punch/fall/impact, +2 to body flip/throw, critical flip/throw on natural 20 (double damage; 4d6 damage), critical strike on natural 20..
Level 2: Learns automatic locks, +1 on initiative, +2 to parry and dodge. Level 3: Learns knife hand knock-out, add +1D6 to P.P.E or I.S.P., +1 to disarm. Level 4: One additional attack per melee, +1 to strike, +1 to body flip/throw . Level 5: Automatic Dodge, critical flip/throw on natural 18 or better (double damage), +1 to body block tackle. Level 6: +1 to parry and dodge, +1 to body flip/throw (flip/throw damage does 2D6 extra damage instead of the usual 1D6 damage, inflicting 3D6 total damage). Level 8: One additional attack per melee, +1 to breakfall. Level 9: +1 on initiative, +1 to strike, parry and dodge. Level 10: Add +2D6 to P.P.E. or I.S.P., +1 to disarm. Level 11: +1 to parry, +2 to dodge, and +1 to body flip/throw. Level 12: One additional attack per melee. Level 13: +1 on initiative, +2 to body block/tackle. Level 14: Critical strike on natural 18, 19, or 20.